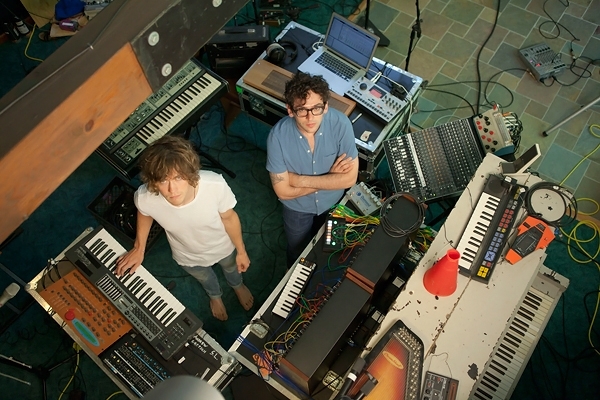 For the better part of the past year, MGMT have been holed up at a woodsy cabin outside Buffalo, New York, that resembles a Rube Goldberg version of a recording studio: Nearly every corner of every room is stuffed with keyboards, drum machines and guitars. For hours on end, the duo of Andrew VanWyngarden and Ben Goldwasser program synth loops in one room, then run next door to trigger another sequence, until the entire house is vibrating with spacey, rhythmic music. "We'll get involved in what we're doing," says Goldwasser, "and the next thing we know, we've been improvising for five hours." Three years ago, MGMT confounded fans with their second album, Congratulations, which ditched any reprise of their breakthrough 2008 hit "Kids" for far-out psychedelic sojourns. "People thought we took too many drugs, which was not the case at all," insists Goldwasser, taking a seat on a studio couch. Adds VanWyngarden, "We were less naive after Congratulations." But rather than retreating, MGMT are getting even weirder on their follow-up, tentatively due out in June. Instead of using their live band, as they did on Congratulations, the core duo recorded alone, cherry-picking the best parts of their free-form jams to construct tracks that reflect the Aphex Twin and house records they've been listening to lately. Says Goldwasser, "We're not trying to make music that everyone understands the first time they hear it." Swirling electronic highlights include "Mystery Disease" and "Alien Days" – which VanWyngarden explains is "about that feeling when a parasitic alien is in your head, controlling things." They also recorded a version of "Introspection," a mega-obscure Sixties garage rocker by the Long Island cult band Faine Jade. "The recording process was really strange," says co-producer Dave Fridmann. "So we did a cover just to say, 'Let's get back to planet Earth for a second.'" Despite a U.K. press report to the contrary, the duo say their label, Columbia, hasn't pressured them to make a more accessible record this time. "There's no illusion on their part that we're going to turn into a Top 40 band," says VanWyngarden. "That's kind of comforting."